There have been demonstrations in Venezuela after the Supreme Court took over legislative powers from the National Assembly. Critics say the development takes the country closer to one-man rule under President Nicolas Maduro. Luis Almagro, the secretary general of the Organisation of American States (OAS), described the move as the "final blow to democracy in the country". The ruling effectively dissolves the elected legislature which has been dominated by the president's opponents. 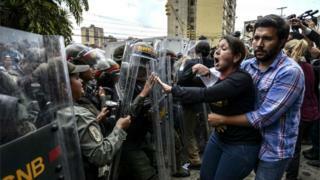 Mr Almagro also described the move as a "self-inflicted coup" by Mr Maduro's government. It comes after months of consolidation of power by the country's president, who is locked in a political struggle with the centre-right opposition. The court justified the move by saying the National Assembly's lawmakers were "in a situation of contempt" after allegations of electoral irregularities by three opposition lawmakers during the 2015 elections. The court had previously backed the leftist president in his struggles with the legislature - on Tuesday removing parliamentary immunity from the Assembly's members. The National Assembly's lawmakers were pictured scuffling with members of the National Guard while protesting outside the court on Thursday. The Speaker of Venezuela's National Assembly, Julio Borges, addressed the media outside the legislative palace in Caracas. He urged the army, which has so far supported the president, to take a stand against him. In a tweet, jailed opposition leader Leopoldo Lopez called on people to take to the streets in order to "reject dictatorship and rescue democracy". The crisis has raised international alarm about the stability of Venezuela, which has undergone three attempted military coups since 1992. The US state department called the court's move "a serious setback for democracy." Most regional powers including Brazil, Mexico, Argentina, Peru and Chile have warned that the action is a threat to Venezuelan democracy. Venezuela's foreign ministry accused critics of the government of forming a right-wing regional pact against President Maduro. Foreign Minister Delcy Rodriguez described the OAS is a pawn of US "imperialism". Tensions have been high in Venezuela because the country has been engulfed by a severe economic crisis. It has the world's highest inflation rate, and the International Monetary Fund predicts it could reach 1,660% next year. The government and opposition blame each other for the country's economic problems. Image caption President Maduro has attended pro-government rallies including this one on March 9th "against imperialism"